S.P. Thamilchelvan, Liberation Tigers Political Head was killed in Sri Lanka Air Force (SLAF) aerial bombardment Friday morning in Ki'linochchi. LTTE headquarters confirmed that the Head of the LTTE Political Division, S P Tamilselvan, was killed in the SLAF bombardment that took place at 6:00 a.m. Friday along with Lt. Col. Anpumani (Alex), Major Mikuthan, Major Neathaaji, Lt. Aadchiveal and Lt. Maavaikkumaran. The LTTE has conferred its highest military rank, Brigadier, to Thamilchelvan. Tough he never spoke a word of English Tamilchelvan articulated himself to any audience at a level that was both intriguingly slick and fascinatingly agile. He issued the most absurd apologies on behalf of LTTE actions and atrocities on a regular basis. Whether it was his job or not is irrelevant; to most he was a smiling assassin - no, actually, a smiling terrorist. S Paramu Thamilchelvan the political wing leader of the LTTE was Prabhakaran’s designated head of the political wing of the LTTE — the Prime Minister designate in Prabhakaran’s eerie, so far unattained dream of Eelam. He was dapper for a militant, perenially decked in white shirt and black trouser while wearing a trademark grin which spread from one side of his mouth to the other. He wore that toothy smile when he made the most dire threats or most intimidating pronouncements against the Sri Lankan state. Tamilchelvan was an LTTEr since 1984, almost ten years after the LTTE was formed — but it was the time Tamil militancy began in earnest. He was closer in age to Prabhakaran than Anton Balasingham —- a man who was called the LTTE ideologue, a good twenty years senior to Prabakaran and more comfortable in Colombo’s editorial rooms and NGO lobbies, being an ex journalist, than he was in the rough terrain of the Wanni. Not so, Tamilchelvan. He was militant to boot, suitably injured in fighting in Jaffna in 1992. Therefore, in the skin, Tamilchelvan was closer to Prabhakaran as a working militant, a man who was a crack shot who is supposed to have been able to take out any target from any distance. He was therefore the ideal front man for Prabhakaran in Kilinochchi, a gun toting smooth talker who could meet with negotiators mediators diplomats and the like. Tough he never spoke a word of English Tamilchelvan articulated himself to any audience at a level that was both intriguingly slick and fascinatingly agile. In the fashion of LTTE militants who turned civilian administrators and then were gentrified, he married a fellow LTTE cadre, and was the father of two girls. He also issued the most absurd apologies on behalf of LTTE actions and atrocities on a regular basis. Whether it was his job or not is irrelevant; to most he was a smiling assassin - no, actually, a smiling terrorist. Born in Chavakachcheri, he was educated at Chavakachcheri Hindu College. Trained in Tamil Nadu under the fourth intake of Tiger cadres, he underwent training in the camps set up by Research and Analysis Wing (RAW). Though born low-caste in the caste conscious Jaffna Tamil society, Thamilchelvan married from an upper-cast family which owned property in Colombo. His wife later joined the women’s wing of the LTTE. His marriage was said to be arranged by Anton Balasingham. Adele and Anton Balasingham were the attesting witnesses forThamilchelvan. As a personal body guard of the Tiger supremo Prabhakaran, Thamilchelvan accompanied him in his exile in India in 1985. When, Prabha planned his return to Jaffna in 1987, Thamilchelvan was dispatched to examine whether the ground situation was conducive for the return of the Tiger leader. Upon his return to Jaffna, Thamilchelvan was appointed LTTE’s military leader of Thenmarachchi, his home town. He remained in that position till 1991, and was appointed the military commander of Jaffna, filling the position made vacant after the demise of then Tiger commander of Jaffna, Kittu alias Sathasivan Krishnakumar. Thamilchelvan’s rise in the Tiger hierarchy was facilitated by his undying loyalty to the Tiger supremo Prabhakaran, a characteristic which made him a lackey of Prabhakaran in the eyes of critics. A battle field injury sustained in Pooneryn battle, left him with a limp. He was assigned to political affairs of the LTTE. Prabhakaran was keen to appoint his loyalists into key positions following the fall-out of the then deputy leader of the LTTE “Mahattaya”, who was later killed under the orders from Prabhakaran. With the loss of Kittu and internal rivalries in the movement, Prabhakaran heavily relied on Thamilselvan as a military commander. Thamilchelvan in return proved his mettle in the battle field, commanding a daring and equally destructive attack on the Pooneryn camp of the Sri Lanka Army. 441 military personnel were killed in the attack of whom over 200 are believed to be executed by the LTTE after they were taken prisoner. Another split within the LTTE elevated Thamilchelvan to the top of its political office. Yogaratnama Yogi, who headed the Tiger delegation to talks with the Chandrika Kumarathunga Administration was stripped of his position, following the collapse of peace talks in 1995. Prabhakaran’s choice was to appoint Canadian trained aeronautical engineer Shankar. However, Balasinghham intervened to appoint Thamilchelvan to the position vacated by Yogi. Down graded from the rank, Yogi now hands translations of documents at the Tiger political office. He identified himself as Thamilselvan only after he was assigned to the political division of the LTTE in 1993. On Thursday night, the Political Chief had slept at a bunker in the Thiruvaiyaaru area. The bomber jets had dropped the “bunkerbuster” type of powerful bombs and scored a “bull’s eye”. The entire structure had crumbled due to the bombing. It took LTTE cadres several hours to excavate the bodies from under the debris. Thamilselvan’s body was the last to be dug out. The mood amidst cadres and supporters of the Tamil Eelam Liberation Tigers was on the ascendant after the successful attack on the Anuradhapura air base. Thursday November 1, saw a special ceremony being held in the Wanni, where Tiger Supremo Velupillai Prabhakaran awarded four different types of military honours for those involved in various aspects of “Operation Ellalan”. But this euphoria of victory over the air force at Saliyapura was short lived. Within 24 hours of the award ceremony, the Sri Lankan air force struck back. The buoyant LTTE mood turned gloomy. The air force, down in the doldrums after the Anuradhapura debacle, became chirpy again. Such are the fluctuating fortunes of this fratricidal fighting. At first light on Friday, November 2, Israeli built K-fir jet bombers and Russian supersonic MiG 27s engaged in aerial bombardment over Iranaimadhu east, south Kilinochchi town and its suburbs like Anandapuram and Thiruvaiyaaru. Two civilians were killed and six injured. But the biggest casualties were suffered by the LTTE. Suppiah Paramu Thamilselvan, the 40-year old head of the LTTE’s political division was killed along with five other Tigers in the aerial attack. The others killed along with Thamilselvan in the Thiruvaiyaaru bombing were Muthukkumaru Soundarakrishnan alias Lt. Col. Anpumani, Dharmarajah Vijayakumar alias Major Mihuthan, Karunanidhi Vasanthakumar alias Capt. Kalaiyarasan, Panchatcharam Sajeeban alias Lt Aatchivel, and Muthukkumaarakkurukkal Srigayathrinatha Sarma alias Lt Maavaikumaran. All of them were from villages in the Jaffna District. Maavailumaran is the son of a Brahmin priest. Anpumani also known as Alex and Mihuthan, were from the political wing. Kalaiyarasan a.k.a. Nethaji, Aatchivel and Maavaikumaran were Thamilselvan’s bodyguards. Anpumani or Alex is a skilled photographer and known to many media persons. He is in charge of the strategic communications unit of the LTTE’s political wing. Closely associated with Thamilselvan, Anpumani has accompanied the political commissar on trips to Europe. According to Lt. Col. Pappa, the chief of LTTE sports division, Thamilselvan and others had been killed in their sleep. Senior LTTE leaders do not sleep at the same place each night due to security reasons. Thamilselvan used to rotate among three or four different places. On Thursday night, the Political Chief had slept at a bunker in the Thiruvaiyaaru area. The bomber jets had dropped the “bunkerbuster” type of powerful bombs and scored a “bull’s eye”. Pappa informed Thamilselvan’s brother in Canada that the entire structure had crumbled due to the bombing. The target was hit a few minutes after 6 a.m. It took LTTE cadres several hours to excavate the bodies from under the debris. Thamilselvan’s body was the last to be dug out. Though rumours began circulating about Thamilselvan’s death, the LTTE kept it under wraps for a few hours. The bodies of Thamilselvan and others killed were moved at about 10.30 a.m. to a safe location. LTTE Leader Prabhakaran then visited that place around 12 noon and paid his respects. Prabhakaran was very fond of Thamilselvan and seemed very angry and disturbed over his killing. The LTTE Leader also bestowed Brigadier rank posthumously upon Thamilselvan. It was at 1 p.m. that the LTTE officially announced the deaths of Thamilselvan and others through a press release. Thamilselvan is the first Tiger to be made Brigadier. Earlier the highest rank of Tiger fighter was Captain. Former LTTE north-eastern commander Ravindran alias Pandithar, was only a captain when killed in 1985. Later, the higher ranks became Major. Former Mannar Commander Victor was a Major when killed in 1986. Nowadays, the highest rank is Colonel. Seniors like Soosai, Bhanu, Sornam, Balraj, Theepan, Jeyam etc are Colonels. Even Karuna was a Colonel in the LTTE. Thamilselvan has become the first Colonel to be killed in battle and so was made Brigadier posthumously. He is now the first Brigadier. If others of Colonel rank are killed, they too will be given Brigadier rank. In what seems a crude attempt to humiliate Thamilselvan, some government websites and state-controlled media refer to Thamilselvan being of the “ambattan” or barber caste and that he was a barber before joining the movement. Yes, Thamilselvan belonged to a traditional barber community regarded as “low” in the caste hierarchy of conservative Jaffna. His father ran a salon in Chavakachcheri. But Thamilselvan was a student when he joined the LTTE and did not work as a barber. There is no shame even if he did so, but that did not happen. Thamilselvan’s growth and evolution within the LTTE was meteoric. It was also an illustration of how persons from the underprivileged sections of the Tamil community could rise to positions of authority within the LTTE. Despite his caste background, Thamilselvan to his credit, transcended that barrier and became political commissar of the movement that claims to be the sole representatives of the Tamil people. He was able to head the LTTE political wing and participate in discussions with the national and international elite on equal terms. Thamilselvan was born on August 29, 1967 at Maanaavalai in Madduvil, a sprawling agrarian village in the Thenmaratchy sector of Jaffna district. He was the fifth among six children. There were five boys and a girl in the family. All his brothers are elder to Thamilselvan. His eldest brother is Balasubramaniyam alias Moorthy who is also a senior member of the LTTE. Moorthy was a close confidante of former LTTE Deputy Leader Gopalaswamy Mahendrarajah alias Mahattaya. Moorthy was one of the LTTE delegates who participated in discussions with the government in Colombo when Ranasinghe Premadasa was President. Moorthy fell from grace after the Mahattaya downfall and was detained. He was released after a long period of incarceration. Demoted from his earlier positions, Moorthy is now a low rung cadre engaged in clerical work for the LTTE. One of his daughters is also in the LTTE. According to family members in Canada, it was Moorthy who informed them first of Thamilselvan’s death. Thamilselvan’s mother, two brothers and younger sister are living in Canada. Another brother lives in Norway. His father is not among the living. Thamilselvan is married and has two children. His wife Sasirekha is a former woman cadre of the LTTE. Her nom de guerre was Isaichelvi. Their 8-year old daughter is Alaimagal (daughter of waves). The 4-year old son is Oliventhan (king of light). His wedding was one of the first in a new scheme introduced by the LTTE Supremo. Prabhakaran evolved a plan whereby women cadres of the LTTE were to be paired off with male cadres through suitable matchmaking. Since arranged marriages are a part of Tamil social practice, this scheme was seen as mass scale arranged marriage. Prabhakaran himself selected the bride for Thamilselvan from an upper caste family, in a deliberate bid to erase caste inequalities and bring about an egalitarian society. Sasirekha’s family hailing from Chulipuram in Jaffna, once owned a lot of businesses in Bambalapitiya and sold them after July 1983. Prabhakaran and his wife Mathivathany acted as Thamilselvan’s “parents” while political advisor Anton Balasingham and wife Adele, acted as the bride’s “parents.” Brahminic rituals were dispensed with. Thamilselvan’s mother in Canada was not informed of the marriage until the last minute. When she asked her son why he did not inform them earlier, Thamilselvan replied “I myself came to know only four days ago”. Thamilselvan had his primary education at the Madduvil Chandramouleeswarar Vidyalayam and secondary schooling at Chavakachcheri Hindu College. His family was politically conscious and was for long, active supporters of Shanmugadasan’s pro-Beijing Communist party. His father and elder brothers participated in many activities against caste discrimination. They were in the forefront of the protest demanding that the famous Pandrithalaichi Amman temple in Madduvil be thrown open for all to worship. This was done in 1970. With the escalation of the ethnic conflict, Thamilselvan’s family like many other Tamil families, shed their Marxism and became increasingly Tamil nationalistic. Thamilselvan joined the LTTE after the July 1983 violence at the age of 16. By international standards, he was a child soldier at that time. According to his brother Sivasubramaniam, Thamilselvan had gone across to India for arms training by boat on June 13, 1984. Thamilselvan was a member of the fourth batch of recruits and received military training in the Thirumalai camp near Dindigul in Tamil Nadu. His nom de guerre was Dinesh. It was as Dinesh that Thamilselvan was known for a long time. Later, the LTTE started a de-Sanskritization process of Tamil names. Dinesh was a Sanskritized name, but his real name Thamilselvan was a pure, Tamil name. So Dinesh transformed back into Thamilselvan, the name given by his parents. After training, Thamilselvan was posted to Prabhakaran’s security detail in India. One of his main duties was to function as bodyguard to Mathivathany Prabhakaran. She was an ardent Hindu devotee and Thamilselvan accompanied her to several temples. The young lad’s subservience and sense of duty impressed her very much. This in turn led to Prabhakaran also becoming fond of him. Soon Thamilselvan became a trusted lieutenant. Before Prabhakaran crossed over from India to Jaffna on January 5, 1987, the LTTE Leader sent three of his trusted bodyguards first to Jaffna. Their duty was to inform then Jaffna Commander “Col” Kittu, make the necessary arrangements and then return. Thereafter the trio accompanied Prabhakaran to Jaffna clandestinely. The RAW was furious at his slipping out of their grasp. The trusted trio was Imran, Pandiyan and Dinesh (Thamilselvan). All three are dead now. After returning to Jaffna, Thamilselvan was assigned to the Thenmaratchy sector. He rose rapidly and soon became the Thenmaratchy sectoral commander. What happened was that “Curdles” the legendary Thenmaratchy commander was killed in an accidental explosion in Kaithady along with Ponnamman, Vasu and others on February 14, 1987. The LTTE then appointed two cadres known as Kunchan and Daya as acting commanders. They were inefficient and so Naren, a native of Jaffna town was appointed Thenmaratchy commander. This led to dissatisfaction among cadres from the region who wanted a son of the (Thenmaratchy) soil to lead them. The LTTE was thinking of appointing Abdullah, a Thenmaratchy cadre as divisional commander. But Abdullah along with Pulendran, Kumarappa and others consumed cyanide in October 1987. This incident led to war breaking out with the Indian army stationed in North-East Lanka. The Thenmaratchy sector was leaderless. So Thamilselvan was made commander in October 1987. Pappa was his deputy. Casteist elements among the people resented this, but Prabhakaran stood firm. In 1991, Thamilselvan was made military commander and later special military commander for the Jaffna district. Thamilselvan’s rise was resented by many cadres who felt he was Prabhakaran’s blue eyed boy. Thamilselvan endeared himself to the leader but aroused resentment among colleagues by sneaking about them to big boss. The nickname for him among comrades was “Thagadu” meaning ‘sneak’ colloquially. Former Tiger colleagues say that Thamilselvan eliminated “competition” by getting potential rivals sidelined through his sneaking to Prabhakaran. He was responsible for the downfall of many colleagues including Dominick, a former Jaffna political commissar. Dominick apparently had cracked a joke “critical” of Prabhakaran among his comrades. Thamilselvan secretly recorded it and promptly passed it on to Prabhakaran. Dominck was expelled and is now living abroad with his wife who was a judge in the Tiger judiciary. Dominick’s father himself was a district judge in Sri Lanka. Thamilselvan played a prominent role in souring relations between Prabhakaran and Karuna. If Pottu Aman caused the Karuna rift Thamilselvan helped widen it. His proximity to Prabhakaran may have led to his being promoted rapidly. Whatever the cause of elevation, the man has not been found wanting in the discharge of his duties. It may be that others could have performed those better, but Thamilselvan was adequately competent. That has to be granted. Whatever his personal flaws, Thamilselvan was a brave fighter. But he is not credited with having great military acumen like Balraj, Sornam, Bhanu or Theepan. He was seriously injured in the Elephant Pass battle of 1991, when he was Thenmaratchy commander and in the Pooneryn battle of 1993 when he was Jaffna District commander. Among other major battles he participated in were “Operation Yarldevi”, and the LTTE attacks in Silavathurai, Karainagar and Thachankaadu. After the Pooneryn battle, Thamilselvan was on the verge of death and survived miraculously. Most of the flesh on a leg was stripped away. He sustained a permanent limp and had to walk with the aid of a walking stick after that. With active military duty ruled out due to injury, Thamilselvan was now utilised on the political wing. Narendran alias Yogi, the former political commissar was expelled from the movement after Mahathaya’s downfall. At one point, Prabhakaran wanted to appoint Sornalingam alias “Col” Shankar in place of Yogi. But Balasingham who did not like Shankar, intervened and persuaded Prabhakaran to appoint Thamilselvan instead. Prabhakaran did so and caused much resentment among the rank and file. Balasingham took Thamilselvan under his wing and personally guided and coached him. Thamilselvan repaid Balasingham’s kindness by betraying him years later. But that’s another story! In spite of being Political Commissar, Thamilselvan functioned as “kattalai thalapathy” or commanding officer during “Unceasing Waves” operations in the Thenmaratchy sector. He was also seen in military fatigues in August last year when the LTTE attempted to penetrate Muhamaalai. In recent times Thamilselvan was in charge of LTTE defences in Paranthan, Poonagary and Pallavarayankaddu. Thamilselvan also used to travel frequently between the frontlines and Prabhakaran’s abode during the various phases of Operation Jayasikurui. He conveyed confidential reports and orders orally instead of transmitting them through the wireless and running the risk of being intercepted. As political commissar, Thamilselvan received the government delegations led by Kusumsiri Balapatabendi during the peace talks held from October 13, 1994 to March 28, 1995. He participated in all rounds of peace talks held after the signing of the Ceasefire Agreement on February 22, 2002 in Thailand, Norway, Germany and Japan. Balasingham and Prof. G.L. Peiris led the respective delegations. Thamilchelvan also presided over the LTTE conference in Paris on August 23, 2003. After the Paris conference, Thamilchelvan left for Switzerland to study the federal system from August 29, 2003 to September 03, 2003. Once again, Thamilchelvan presided over discussions held to finalise the proposals for an interim administration in the North and East at the Glencree Centre for Reconciliation in Ireland from October 03, 2003 to October 10, 2003. In 2005, Thamilchelvan headed a LTTE delegation to Europe and toured Norway, Sweden, Germany, Belgium, Switzerland, Austria, Finland, Italy, Netherlands, South Africa and Ireland. .
Thamilselvan also participated in the Geneva talks between the Government and the LTTE held from February 22 to 23, 2006 and again from October 28 and 29, 2006 in Geneva. Thamilchelvan would summon the Tamil National Alliance MPs to Kilinochchi and issue directives. It was hilarious yet sad to see political veterans paying pooja to this Johnny-come-lately. He has met with many important personalities in political discussions held abroad and at Kilinochchi. His inability to express himself in English has resulted in excessive dependence on a translator not allowed interpreter. Pancharatnam alias George - an ex postmaster - has accompanied Thamilchelvan everywhere, and become virtually indispensable to the political commissar. There is a joke among Tamil circles that George and not Thamilchelvan spells out the LTTE viewpoint publicly. Thamilchelvan has also given many media interviews and conducted press conferences. Media circles are aware that he craves publicity. He resents sharing the limelight with others like Daya Master, Pulithevan, Elilan, Ilamparithi or Ilanthiraiyan. Some journalists speak in lighter vein about Thamilchelvan’s machinations to cut out the others and hog it alone. He also has a penchant to get photographed. The ‘walking stick man with a perpetual grin’ has become a permanent fixture in Tiger photos. Though inarticulate in English, Thamilchelvan understands the language well. Diplomats have noted that Thamilchelvan uses George only to interpret what he says in Tamil but responds without translation to what is said in English by the other party. Thamilchelvan speaks very fluently in Tamil and is never at a loss for words. The content is poor and shallow. His Tamil interviews are relished by certain segments of LTTE supporters. Many however felt that he mechanically repeats things and call him “kilipillai” or parrot. Many Tamils refer to him as “Soonaa Paanaa” derived from his initials in Tamil.The be-spectacled Thamilchelvan has an ever smiling face and amiable disposition. He has in recent times become the “smiling” face of the LTTE. His inter-personal skills are good. This benign countenance does not mean that the political commissar is “soft”. People who tried to override him or overwhelm him have found themselves unsuccessful. Thamilchelvan reflects Prabhakaran’s thinking perfectly. At times diplomats have found him to be uncompromisingly intransigent despite the smiling exterior. He shakes his head from side to side smiling all the time. This led to a description in the media about him as a “smiling cobra”. When charges are made about LTTE human rights violations, he would deny them with a broad smile. The plastered, permanent grin was resented by many Western journalists and diplomats who perceived it as patently insincere. In the opinion of this writer, Thamilchelvan was a colossal misfit as political commissar during the ceasefire period. Despite his efforts to convince the Europeans of the LTTE’s bonafides, the EU went ahead and banned the LTTE. He also mishandled relations with the SLMM. The Oslo talks in 2006 fiasco was due to Thamilchelvan’s exaggerated vanity, when he insisted that he would sit down at the negotiating table with only a senior minister. When the six rounds of talks with the government took place, Thamilchelvan would describe them as productive and meaningful. But when the LTTE pulled out of talks Thamilchelvan did a volte-face and said all the rounds of talks were meaningless and useless. Only Thamilchelvan could say such things and still hope to retain credibility. Thamilchelvan, like Pottu Amman, is an unquestioning acolyte of Prabhakaran. His loyalty was immense and he was a trusted deputy not allowed confidante. His relationship with Prabhakaran has been Thamilchelvan’s passport to success within the movement. There have been many attempts on Thamilchelvan’s life including a close call when a claymore mine killed his chief bodyguard. The Political Commissar was travelling in another vehicle behind. The army’s deep penetration squad was suspected. He has also had many narrow shaves during aerial bombardment and artillery shelling. Being political commissar since 1994, Thamilchelvan has become the political face of the LTTE in recent times. He personifies the political dimension of the Tigers. Because of this, his death is perceived and even depicted as a terrible loss to the LTTE. A larger than life image is being projected of him. The truth is that the death may be a personal blow to Prabhakaran, but no great loss to the LTTE. Thamilchelvan did not influence policy on important issues. He is not an advocate of a peaceful settlement through negotiations. His political role was subordinate to the overall military imperatives of the LTTE. Anyone with mediocre ability can perform the political tasks Thamilchelvan was carrying out. His militaristic usefulness was impaired. Only Prabhakaran will feel his loss keenly as it would be difficult to procure a trusted minion of Thamilchelvan’s slavish calibre. Already the LTTE’s Police Chief Nadesan has been appointed head of the political division. Nadesan, a former police constable is originally from Valvettithurai and speaks all three languages with reasonable fluency. Nadesan’s wife is a Sinhalese from the Matara District. She lives in the Wanni now. Now the man, who accused Colombo of waging a genocidal war and warned that the LTTE is exercising patience, is dead. 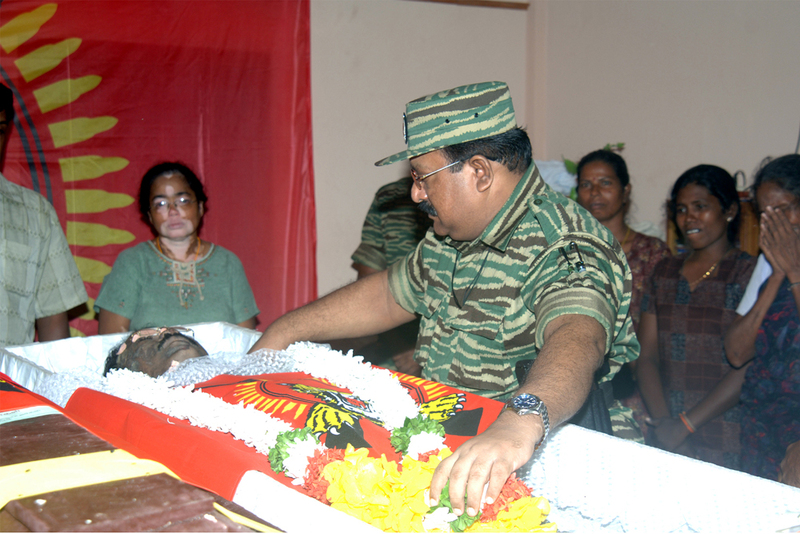 The LTTE has declared three days of mourning till November 5. Velupillai Prabhakaran will definitely feel the loss and vow vengeance. The triumphant crowing about the killing by Gotabhaya Rajapaksa can add fuel to the fire raging in the LTTE Supremo’s heart. Thamilchelvan’s death may very well lead to a further hardening of Tiger attitudes. The undeclared war may become a declared war. The conflict may intensify. Many political personalities in the South could become targets. We are in for troubling, turbulent times.